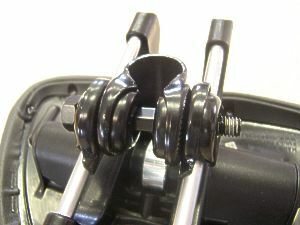 Remove the outer "D" shaped retaining plate. 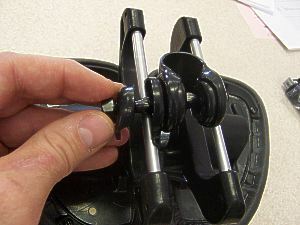 Remove and separate the right side inner round piece from the center "U" clamp. 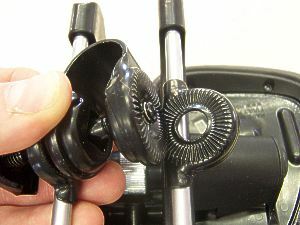 Pull out the center Rod. 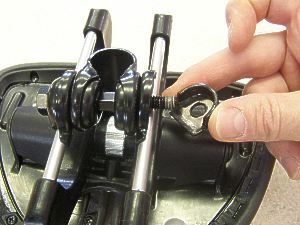 Remove and separate the left hand inner round piece from the center "U" clamp. 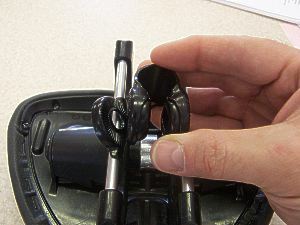 Insert the center "U" clamp in between the rails of your seat, and insert the left hand inner round piece between the rail and the U clamp. 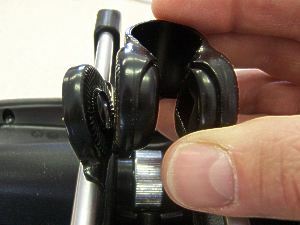 Rotate the inner round piece to press the toothed sides flat together. 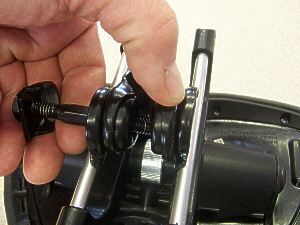 Insert the center rod, but not all the way through. These are the steps that are important. 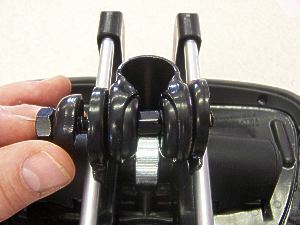 Insert the right hand inner round piece onto the seat rail just below the "U". It is a tight fit, press hard. 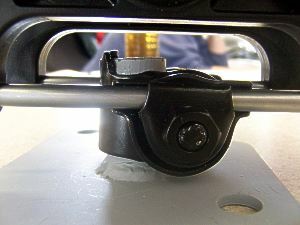 If they are not pressing flat, try lifting up on the rod and pressing down on the center. 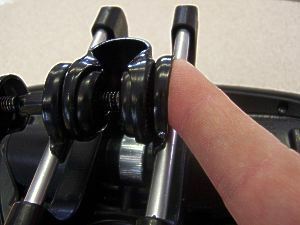 Also try pressing the inner round piece at the same time with your other hand. 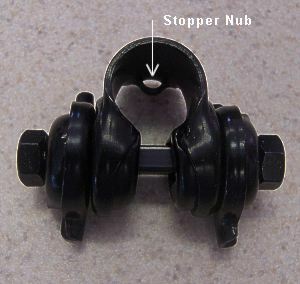 It will snap in place, be firm. 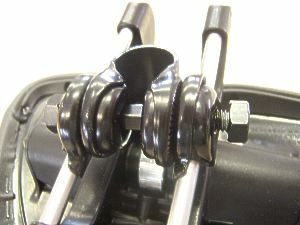 Align the centers of each piece. 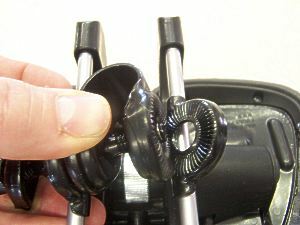 Push the rod through the centers. 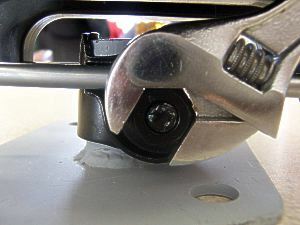 Install the outer "D" shaped retaining plate. 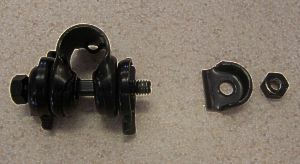 The outer "D" shaped plate should fit inside the Inner round piece. 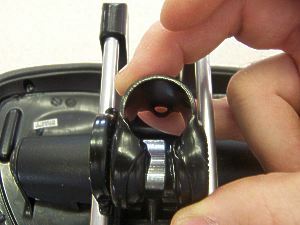 Place your seat over the post of the exercise bike seat adaptor or your bicycle's 7/8" seat post. 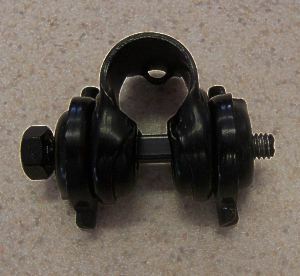 Exercise bike seat adaptors are available here. 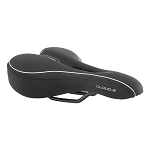 Seat posts are available here. 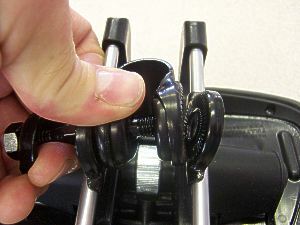 Tighten the nuts on both sides. A socket wrench is best.